Companies big and small suffer losses from employee dishonesty and employee theft, otherwise known as “fidelity.” According to the 2014 “Report to the Nations on Occupational Fraud and Abuse,” by the Association of Certified Fraud Examiners (ACFE), a typical business can expect to lose 5 percent of its revenue to fraud each year, many instances of which go completely unnoticed. Even with quick detection and great insurance protection, however, a happy ending isn’t likely. Organizations can spend countless hours and resources trying to prove internal fraud, let alone recovering all or part of the loss. 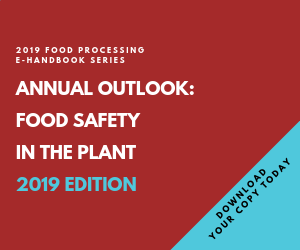 To protect themselves and minimize losses, organizations in the food processing industry need to set up the right procedures and policies to encourage employee reporting and adequate oversight companywide. The 2014 ACFE report found that organizations that lack effective anti-fraud controls lose significantly more time and money to occupational fraud schemes than those companies that have even basic controls in place. Management should take a step back and review the existing preventive measures and develop a plan to ensure that they’re encouraging an honest work environment. D.M. Studler is the founding member and managing officer of SDC CPAs LLC, a global investigation and forensic accounting firm. Contact her at 630-820-5770 or info@sdccpa.com. Fraud investigators, including forensic accountants, typically rely on a three-step model called the “fraud triangle” to explain why employees commit fraud against their companies. This model, according to the ACFE, summarizes a concept first presented in the book, “Other People’s Money: Study in the Social Psychology of Embezzlement,” by criminologist Donald Cressey. The concept was then incorporated into the 2002 Statement on Auditing Standards No. 99: Consideration of Fraud in a Financial Statement Audit, by the Auditing Standards Board of the American Institute of Certified Public Accountants. The theory asserts that employees commit fraud when three elements merge: pressure, opportunity and rationalization. Employees must feel like they have a reason to commit fraud, are capable of committing fraud within the scope of their job responsibilities and must be able to justify their actions to themselves. Stay alert. Background checks and verifications are a good start, but companies should have ongoing reporting procedures in place to flag fraudulent behavior. Even in small, family-owned businesses, employees’ situations or attitudes can change over time, increasing the potential for fraud. It’s especially important for small businesses to stay vigilant since, according to ACFE data, they suffer disproportionate losses compared to larger companies, which could mean financial ruin. Limit access. The best way to reduce the potential for internal fraud is to set up a system of checks and balances for every level of the company. That way, someone will notice fraudulent behavior quickly and help mitigate any damage. For example, one employee should never be responsible for receiving vendor invoices, authorizing payments and maintaining payment records. Similarly, companies should implement inventory management procedures that can track items throughout the supply chain so that it’s easier to identify where “disappearances” occur. State and enforce repercussions. Organizational policies regarding fraud should be clear to all employees. Management and human resources should work together to set clear expectations and define disciplinary action for fraudulent behavior. If employees know exactly what the company will do to those who commit fraud, they may think twice before taking the risk. Support an ethical culture. The ACFE reports that many expensive losses stem from perceived unethical behavior by management, which leaves employees feeling uncomfortable and uninterested in their employers’ fates. Without a mutual respect between management and staff, employees are much more likely to lash out against the company. Actively encourage reporting. The ACFE also reports, however, that the No. 1 fraud detection method is suspicious activity tips from employees. Employees should feel comfortable reporting potential wrongdoing directly to management or by use of a hotline monitored by third parties, and also relying on the company for support when they’re dealing with external pressures that have the potential to incite misappropriation of incoming or outgoing company funds, or mishandling of assets. Survey of middle-market firms points to revenue and employment growth.